This is the fifth post in the Colours of Ancient Egypt series; you can read the introduction here, or all about the colour blue, red, and yellow. In Ancient Egypt, perhaps unsurprisingly, the colour green was associated with life and vegetation. However, it was also linked with the ideas of death. In fact, Osiris, the Egyptian god of fertility, death and afterlife, was commonly portrayed as having green skin. Even scarabs, popular amulets and seals, were often green due the beetle’s symbolic connotation to rebirth and immortality. 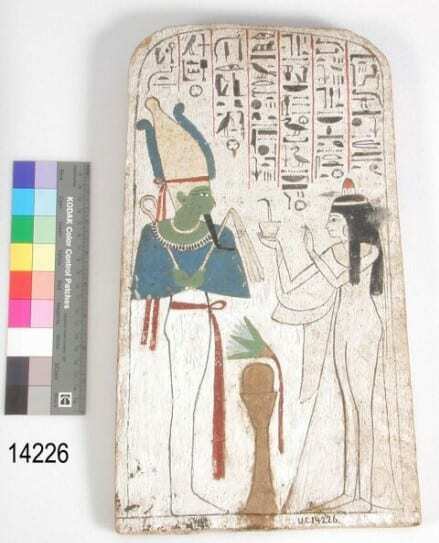 Painted wooden stela of Neskhons, wife of the High Priest of Amun Pinedjem (II) making an offering to Osiris, identifiable by his green skin (Petrie Museum, UC14226). 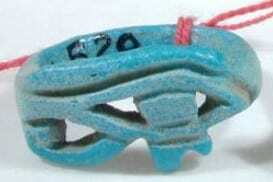 Green faience scarab amulet from Amarna (Petrie Museum, UC1196). By far the most prevalent, and likely the oldest, green pigment was made from a mineral called malachite. It is a copper carbonate and a relatively stable colourant, although sensitive to excessive heat and acid exposure. It was popular in Egyptian tomb painting from the 4th Dynasty (c. 2613 to 2494 BC) onwards but didn’t find much use in European painting until the 15th and 16th centuries. 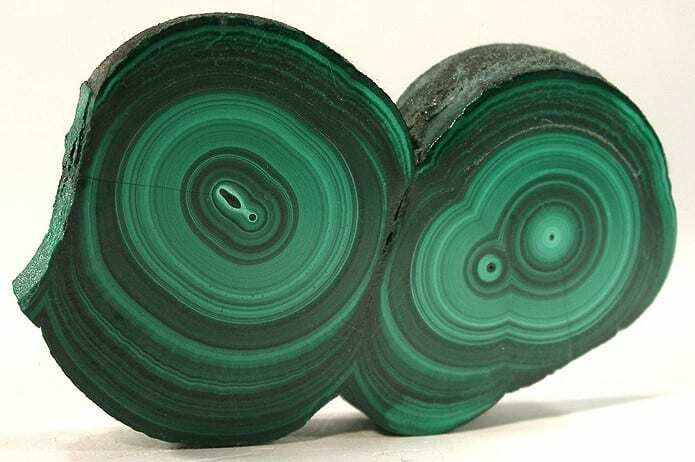 Cross-section of malachite (Image: Rob Lavinsky). 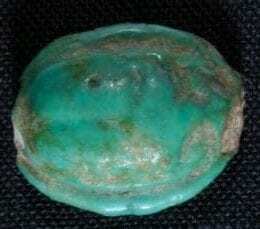 A copper acetate, called verdigris, has also been found on Egyptian art. It gives a slightly transparent bluish green, often applied over a ground of lead white or lead-tin yellow. It’s artificially produced by exposing copper plates to acetic acid, a by-product of wine-making. The reaction that follows produces a blue-green deposit, which can then be scraped off, ground, and used as a pigment. Unfortunately, verdigris is very reactive and can become dark brown or even black with ageing. However, it was identified as the primary green pigment on the headband of Queen Nefertiti’s bust, where it retains its hue. In addition to its instability, verdigris is also moderately toxic due to its copper content. Therefore, its use gradually declined through history, to be mostly replaced by a new pigment, viridian, developed and patented in France in 1859. Viridian is both permanent and non-toxic which immediately made it a great substitute for the older green pigments. 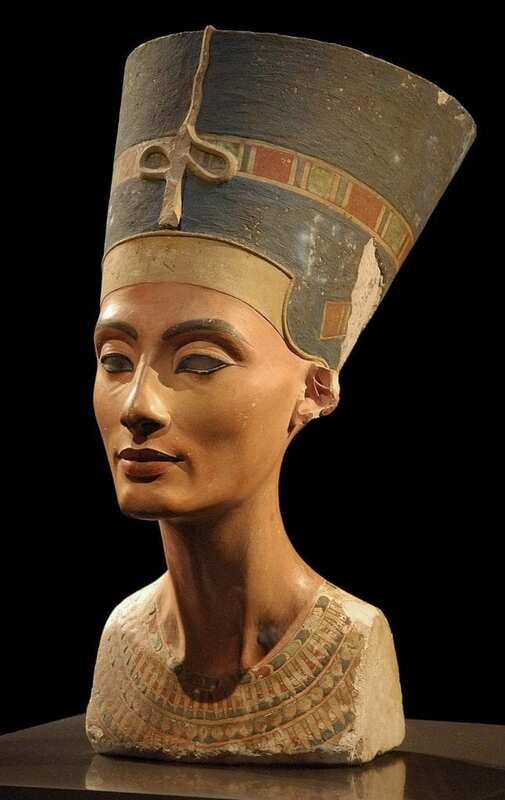 The famous bust of Queen Nefertiti on display at the Neues Museum, Berlin (Image: Philip Pikart). Other sources of green colour included an artificial green frit (produced the same way as blue frit or Egyptian blue, except that the lime content has to be higher than the copper content) as well as mixing Egyptian blue with yellow ochre. The latter method was occasionally used during the 12th Dynasty (1991-1786 BC) but became popular during the Amarna period (1370-1352). 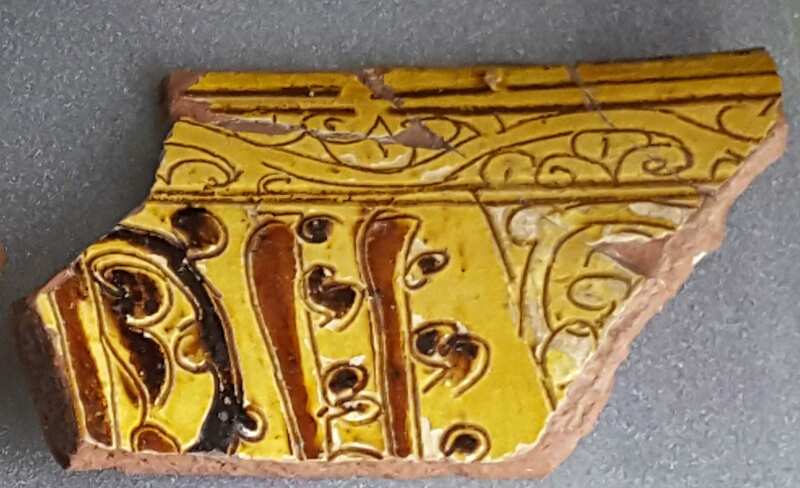 For faience, copper and iron oxides were mostly used, until the discovery of yellow lead antimonate gave Egyptian artisans many more choices of hue. 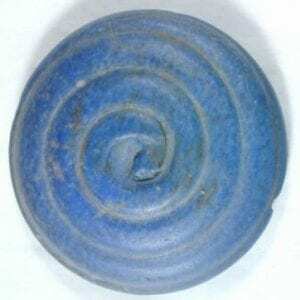 This is the fourth post in the Colours of Ancient Egypt series; here you can read the introduction, here all about the colour blue, and here about the colour red. Due to its availability in several different forms and shades, yellow was present in many aspects of ancient Egyptian art and decoration, from painting to pottery. Fragment of a vessel (Petrie Museum, UC25325; Photo: Anna Pokorska). Pottery vessel containing rough pieces of pale and deep yellow pigment (Petrie Museum, UC59746). 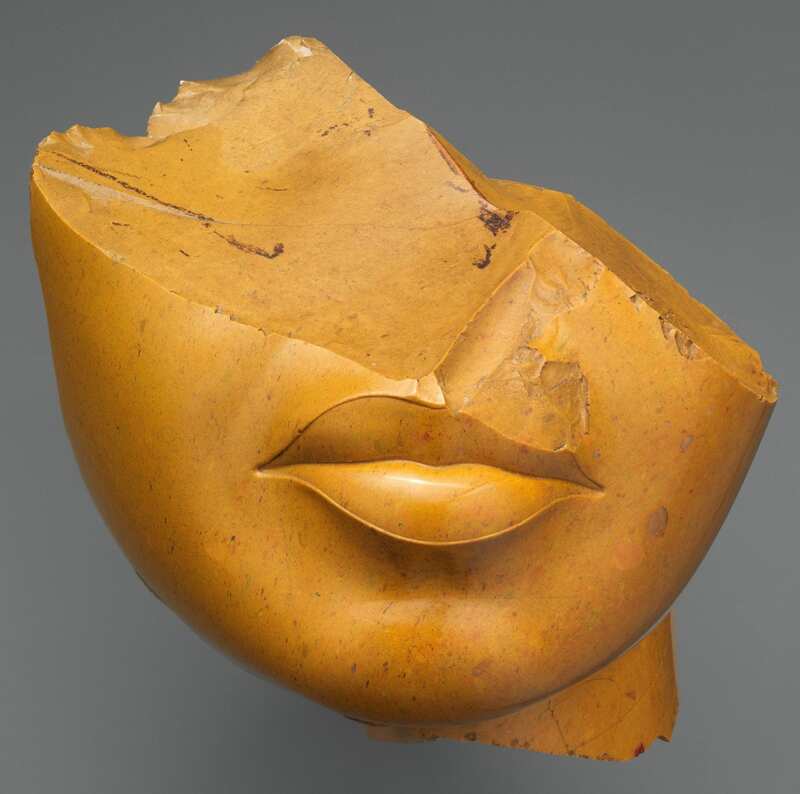 Just as men’s skin was painted red in Egyptian painting, women’s can be distinguished by its yellow colouring, which we can see in a fragment of a statue made out of yellow jasper possibly depicting Queen Nefertiti or Queen Kiya and dated ca.1353–1336 BC. Fragmentary head of a Queen in yellow jasper, from the 18th Dynasty (Metropolitan Museum of Art, NY). Yellow was also used to mimic gold in works where the use of the precious metal wasn’t possible. The most prevalent yellow pigments in ancient Egypt were derived from natural ochres and had the same properties as their red equivalents — but they were by no means the only source of the colour. Painted linen mummy shroud painted with red lead, carbon black, orpiment and Egyptian blue pigments (Petrie Museum, UC38058). Orpiment was a common yellow pigment with a rich lemon or canary yellow shade. It is an arsenic sulphide and occurs naturally in small deposits as a product of hydrothermal veins, hot spring deposits and volcanic sublimation, although nowadays it can be easily obtained artificially. The arsenic content makes it highly toxic and the sulphur will darken lead-based pigments if used together in a mixture. Closely related to — although not as widespread as — orpiment is an orange pigment called realgar which can often be found in the same deposits. Despite its toxicity, it was the only orange pigment available until chrome yellows and oranges were introduced in the beginning of the 19th century. An interesting feature of realgar is that prolonged light exposure turns it into a yellow compound called pararealgar without changing its elemental composition. In addition, Egyptians were able to synthetically produce a highly toxic lead (II) antimonate, also known as Naples yellow. It was often used as an enamel colour from about 1500BC, although it didn’t appear in painting until the Renaissance. As one of the oldest produced artificial pigments it was highly toxic and provided a warm orange shade of yellow. Interestingly, a mineral of the same chemical composition, called bindheimite, exists in nature but wasn’t used to create the pigment. Instead it was made by a calcination of a lead compound (such as lead white) with an antimony compound (e.g. potassium antimonate). A 19th century recipe recommends mixing the ingredients, placing them over a gentle heat and then gradually increasing the temperature. After approx. 5 hrs the calcination is complete, and the resulting product can be ground in water with an ivory spatula (because iron can react with the powder and change its colour). The shade of the pigment could also be manipulated by changing the proportions of the ingredients. Lead antimonate is very stable to light exposure but due to the lead content will turn black on contact with hydrogen sulphide (e.g. in air). Why were so many dangerous substances used as pigments for so long, especially as harmless clays were so abundant? Although their toxic effects were known, the depth and brilliance of the lead and arsenic compounds made the natural iron oxides appear rather dull and brownish in colour by comparison. In fact, even the pigments that strove to replace them — cadmium, chromium and cobalt yellows which appeared during the 19th century — are all harmful to some extent, and it wasn’t until the development of organic pigments (based on carbon and hydrogen) that we overcame this issue! This is the third post in the Colours of Ancient Egypt series; here you can read the introduction, and here all about the colour blue. Red was an easy colour to obtain in ancient Egypt as naturally red minerals, or clays, were abundant. 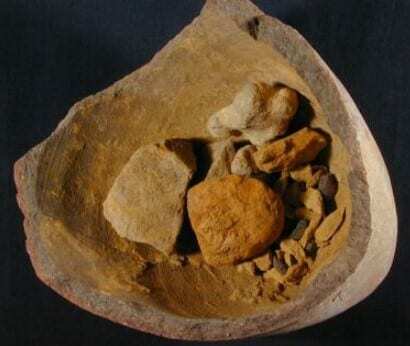 In fact, they were already used as pigments for painting in pre-historic times. Of the earth pigments, as they are often called, ochre was used for red colouring. Like others, it is an iron oxide but gets its red shade from a mineral hematite, which can be naturally present in varying quantities. 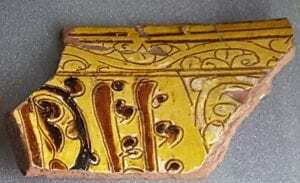 Another way of obtaining the pigment is by heating the more common yellow clay to produce what is called ‘burnt ochre’. 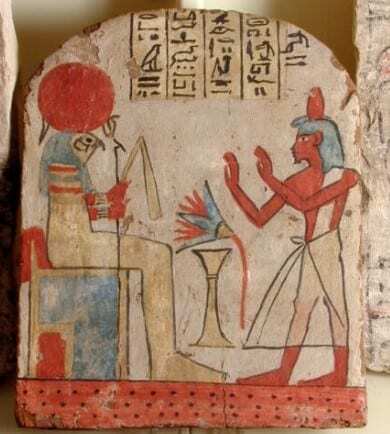 Painted wooden stela showing man Ihefy adoring hawk-headed Horus (Petrie Museum, UC14695). In ancient Egyptian painting we find the red colour often used to distinguish gender, as men’s skin was often painted red. 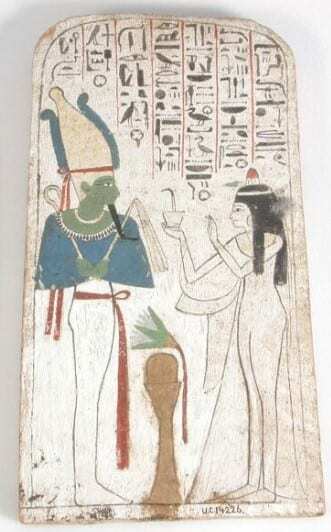 We can see an example of that in this painted wooden stela from the Petrie Museum. Less obviously, red ochre was also popular in cosmetics such as rouge and lip colour. In fact, those pigments are still found in beauty products today due to their ready availability, stability and non-toxicity. However, perhaps the most surprising application of these materials is actually medicinal. The Ebers Papyrus, one of the oldest and most important medical texts from ancient Egypt (dated 1550 BC), prescribes ochre clays as a cure for any intestinal or eye problems. However, minerals were not the only source of red colourants. Ancient Egyptians were also able to tint their textiles using madder or kermes carmine dyes. The former was derived from the root of a madder plant, rubia tinctorum (see below). Madder plant (Image: Franz Eugen Köhler). It was one of the most widely used natural red dyes until the development of synthetic equivalents in the 19th and 20th century. In fact, some madder-dyed cloth was even found in Tutankhamun’s tomb. On the other hand, kermes carmine was made from wingless insects found on certain species of European oak trees. 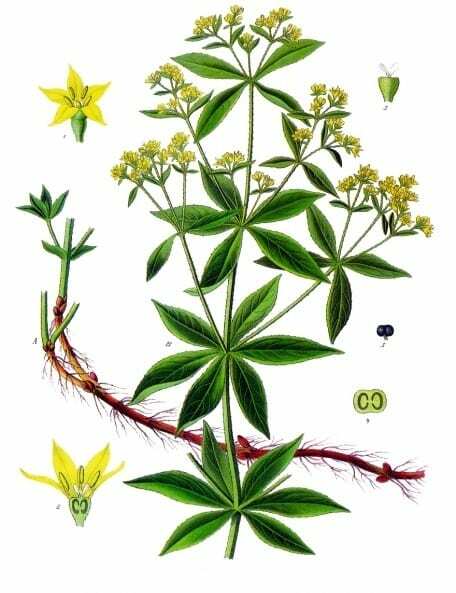 Like madder it was used both as a textile dye and a lake, which is a pale pigment obtained by precipitating a dye onto an inert colourless substrate such as chalk. Kermes’ deep crimson shade made it a very popular colourant for centuries. Fragment of a composite statue from Amarna: right ankle and heel, in red jasper (Petrie Museum, UC150; Photo: Anna Pokorska). 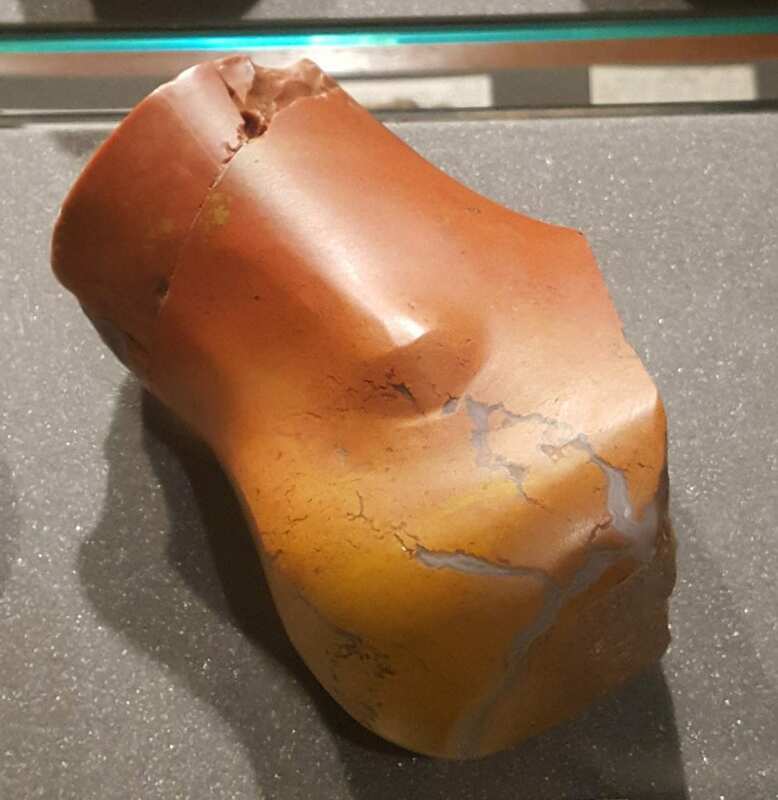 This is a right ankle and heel in red jasper, part of a full-size composite statue from Amarna, dated to the 18th Dynasty. I’ve often stopped in front of it imagining what the statue would have looked like whole. I have to admit that I previously assumed the sculpture to have been entirely made of red jasper, which, in my mind, looked incredible. However, that was not the case; only the exposed flesh would have been carved from red jasper (thus depicting a male figure), while the rest of the statue was likely made from Egyptian alabaster, limestone or wood. The Metropolitan Museum of Art in New York has fragments of a king’s head made of the same material and dated to the same period. In fact, some of the fragments come from the Petrie collection which makes me wonder if they were perhaps part of the same statue. 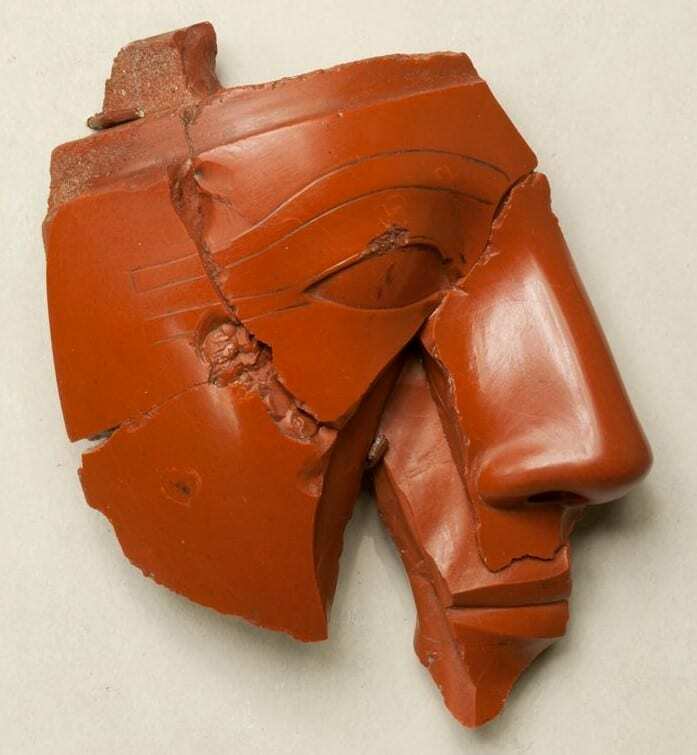 Fragmentary head of a king in red jasper, from the 18th Dynasty (Metropolitan Museum of Art, NY). We may never know. But one thing is certain: even though we’ve since been able to create many synthetic red colourants of various shades, natural red pigments used by the ancients remain as popular as ever. This is the second in the Colours of Ancient Egypt series; if you want to start at the beginning, click here. The colour blue has already featured in a couple of posts in this blog (e.g. check out Cerys Jones’ post on why the Common Kingfisher looks blue) but it seems impossible to me to discuss colour, especially in Ancient Egypt, and not start with blue. Arguably, blue has the most interesting history of all the colours, which can be attributed to the fact that it is not a colour that appears much in nature – that is, if you exclude large bodies of water and the sky, obviously. Naturally occurring materials which can be made into blue colourants are rare and the process of production is often very time-consuming. In Ancient Egypt, pigments for painting and ceramics were ground from precious minerals such as azurite and lapis lazuli; indigo, a textile dye now famous for its use in colouring jeans, was extracted from plants. However, all the above-mentioned colourants presented issues which limited their use. Azurite pigment is unstable in air and would eventually be transformed into its green counterpart, malachite. 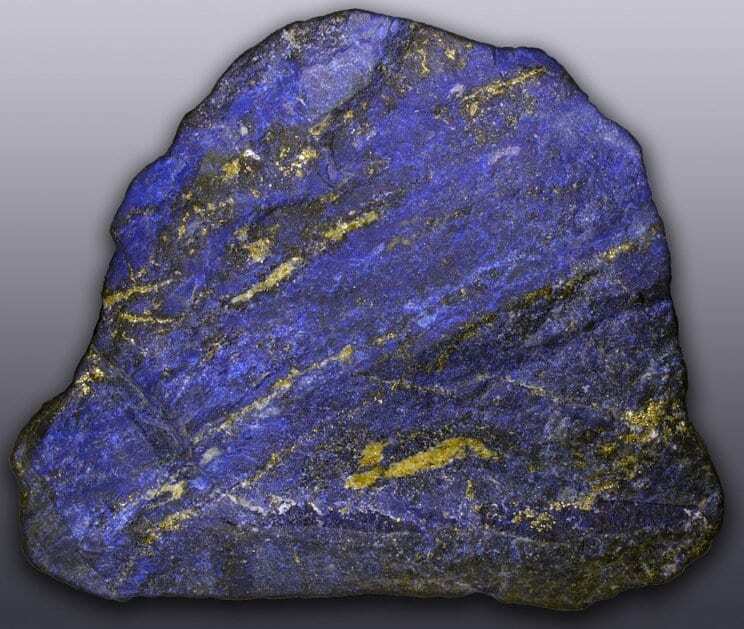 Lapis lazuli had to be imported from north-east Afghanistan (still the major source of the precious stone) and the extraction process would produce only small amounts of the purest colourant powder called ultramarine. Finally, indigo dyes can fade quickly when exposed to sunlight. And yet it seems that the Ancient Egyptians attributed important meaning to the colour blue and it was used in many amulets and jewellery pieces such as the blue faience ring, lapis lazuli and gold bracelet or the serpent amulet from the Petrie Museum collection (below). From left to right: blue faience ring with openwork bezel in form of uadjat eye (Petrie Museum, UC24520); lapis lazuli serpent amulet (UC38655); fragment of bracelet with alternative zig-zag lapis lazuli and gold beads (UC25970). Therefore, the race to artificially produce a stable blue colourant began rather early. In fact, the earliest evidence of the first-known synthetic pigment, Egyptian blue, has been dated to the pre-dynastic period (ca. 3250 BC). It was a calcium copper silicate (or cuprorivaite) and – although the exact method of manufacture has been lost since the fall of the Roman Empire – we now know that it was made by heating a mixture of quartz sand, a copper compound, calcium carbonate and a small amount of an alkali such as natron, to temperatures over 800°C. 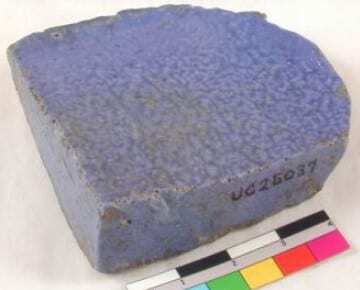 Fragment of fused Egyptian blue (Petrie Museum, UC25037). This resulted in a bright blue pigment that proved very stable to the elements and was thus widely used well beyond Egypt. In fact, its presence has recently been discovered on the Parthenon Marbles in the British Museum due to its unusually strong photoluminescence, i.e. when the pigment is illuminated with red light (wavelengths around 630 nm) it emits near infrared radiation (with a max emission at 910 nm). After its disappearance, artists and artisans had to make do with natural pigments and, being the most stable and brilliant, ultramarine became the coveted colourant once again. In fact, during the Renaissance, it is reputed to have been more expensive than gold and, as a result, often reserved for the pictorial representations of the Madonna and Christ. And so, the search for another replacement was back on. But it wasn’t until the early 1700s that another synthetic blue pigment was discovered, this time accidentally, by a paint maker from Berlin who, while attempting to make a red dye, unintentionally used blood-tainted potash in his recipe. The iron from the blood reacted with the other ingredients creating a distinctly blue compound, iron ferrocyanide, which would later be named Prussian blue. Naturally, other man-made blue pigments and dyes followed, including artificial ultramarine, indigo and phthalocyanine blues. However, it wasn’t quite the end of the line for Egyptian blue, which was rediscovered and extensively studied in the 19th century by such great people as Sir Humphry Davy. And not only are we now able to reproduce the compound for artistic purposes, scientists are finding more and more surprising applications for its luminescence properties, such as biomedical analysis, telecommunications and (my personal favourite) security and crime detection. Lorelei H. Corcoran, “The Color Blue as an ‘Animator’ in Ancient Egyptian Art,” in Rachael B.Goldman, (Ed. ), Essays in Global Color History, Interpreting the Ancient Spectrum (NJ, Gorgias Press, 2016), pp. 59-82. Benjamin Errington, Glen Lawson, Simon W. Lewis, Gregory D. Smith, ‘Micronised Egyptian blue pigment: A novel near-infrared luminescent fingerprint dusting powder’, Dyes and Pigments, vol 132, (2016), pp 310-315. When viewing exhibitions of objects from ancient Egypt (or any ancient civilisation for that matter) we are used to seeing the beige and grey appearance of bare stone. Indeed, we have come to appreciate the simplicity and purity of ancient sculptures, reliefs and carvings, perpetuated by the numerous plaster casts made and distributed both for research or as works of art in their own right (case in point – the Plaster Court at the Victoria and Albert Museum). Let us return to ancient Egypt. To date, many attempts have been made to restore the original colours of artefacts. One such example is the virtual restoration of the Temple of Dendur at the Metropolitan Museum of Art in New York where experts have a created a colour projection to be overlaid on top of the damaged hieroglyphs. An article on the whole project, called Color the Temple, can be read here. Some people object to these types of intervention, sceptical of how well they recreate and represent the work of the artist, especially if little physical evidence of the original colours in a particular artefact exists. And indeed, we must always be careful when it comes to any type of restoration to take it only for what it is – someone else’s idea of what the object would have originally looked like (often dependent on the restorer’s skill). Although they might still have a way to go, I personally find these virtual restoration techniques intriguing and full of potential. They certainly help my imagination and understanding of the ancient Egyptian civilisation. But we can find authentic and undamaged examples of colour even in the Petrie Museum collection. 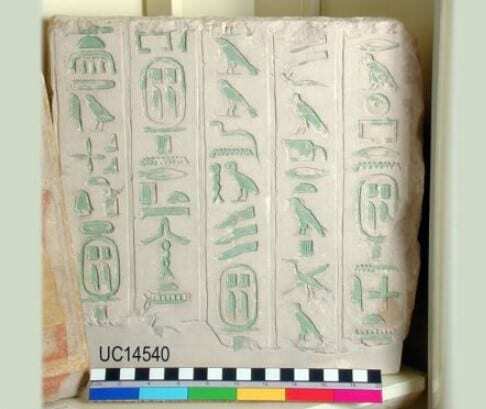 One of the first objects one sees when entering the main exhibition is a limestone wall block fragment from the pyramid of King Pepy I at Saqqara, its beautiful hieroglyphs tinted in green (below). While on the other side of the display is a painted, rather than carved, wooden stela of Neskhons, wife of the High Priest of Amun Pinedjem (II) making an offering to Osiris (above). Egyptian artists would have had at their disposal mostly pigments made from grinding common (as well as some not-so-common) minerals and earths. 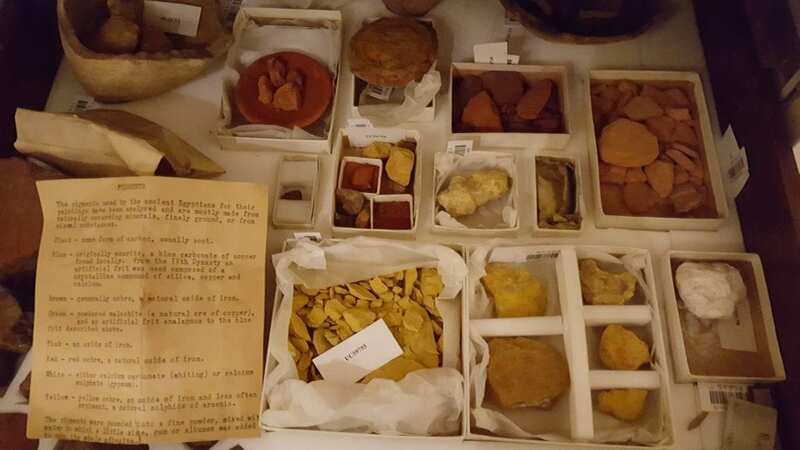 Hidden away in the Petrie Museum storage is a drawer full of exactly those kinds of pigments (below). ‘The pigments used by the ancient Egyptians for their paintings have been analysed and are mostly made from naturally occurring minerals, finely ground, or from natural substances. Black – some form of carbon, usually soot. Blue – originally azurite, a blue carbonate of copper found locally. From the IVth Dynasty on artificial frit was used composed of a crystalline compound of silica, copper and calcium. Brown – generally ochre, a natural oxide of iron. Green – powdered malachite (a natural ore of copper), and an artificial frit analogous to the blue frit described above. Pink – an oxide of iron. Red – red ochre, a natural oxide of iron. White – either calcium carbonate (whiting) or calcium sulphate (gypsum). Yellow – yellow ochre, an oxide of iron and less often orpiment a natural sulphide of arsenic. Unfortunately (or perhaps fortunately), this subject is too broad and interesting to fit into a single blog post and I’ve decided to explore it further, perhaps expanding beyond Egypt and the ancient times. We shall see where this journey takes me, but I hope you will join me as I investigate individual colours in my future posts. You can now read about the colours blue and red.